Renovating an older home has all kinds of challenges, but sometimes the hardest part is finding replacement pieces. Many times, homes have been stripped of their original light fixtures, stained glass windows, or hardware. Other times, time itself has deteriorated pieces beyond repair. The most aggravating part is trying to find historically accurate replacements that even the pros won’t know aren’t “real”. Hardware can be the most aggravating to find, but luckily there are some companies that still realize old homes need fixing too. Window sashes: First of all, don’t replace your old windows! If you’re in need of some heavy cast iron sash weights, check out Architectural Iron. Missing sash pulleys or sash cords can be found at Smith Restoration Sash. Butler Pantry doors: Door no longer swinging? If your looking for a replacement piece, you won’t find one at Home Depot. Instead, check out Bommer Industries double action spring pivot. Viola, problem solved! 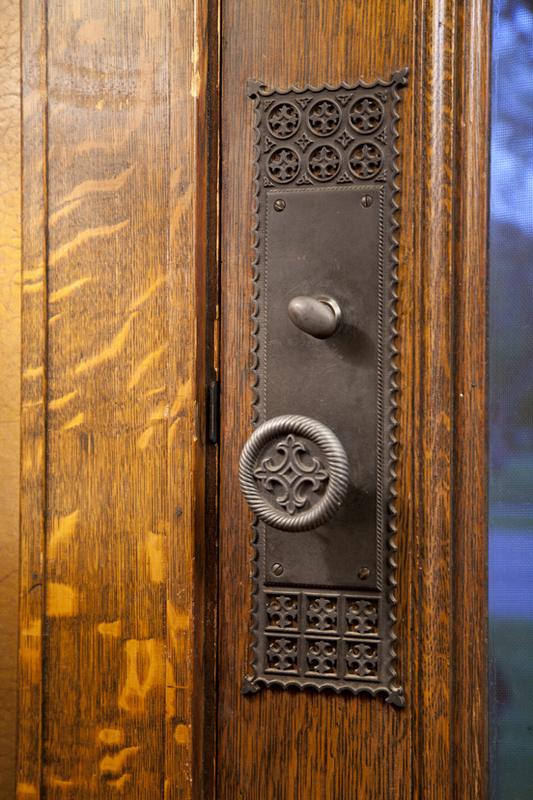 Door knobs: Besides going to your local architectural salvage companies to find original door fixtures, you can also try online sites that specialize in reproduction hardware like Crown City Hardware or House of Antique Hardware, as well as look for original pieces on Etsy or Ebay. The most dramatic pieces of a historic home can be the lighting fixtures. Even the smallest can be inspiring. I love walking around auctions, antique stores, and architectural salvage companies to admire the beautiful chandeliers, sconces, and lights for sale. But you can find great fixtures online, too. Rejuvenation has a special “restored antiques” section where you can buy real vintage light fixtures. Some might be expensive, but if you want the real deal, be prepared to drop some cash. In your search, keep an open mind about replacements. While you may not be able to find an exact replica, there are many options available true to the period of your home. This entry was posted on Thursday, February 19th, 2015 at 12:50 pm	and is filed under Historic Renovation, Interior Details, Maintenance, Misc. You can follow any responses to this entry through the RSS 2.0 feed. You can leave a response, or trackback from your own site.